1. How does the affiliate program work? It’s simple - you can earn, attracting other users to uCoz. You get a unique referral link and post it on your website or anywhere else online to encourage people click it and register at uCoz via this link. Each such user who registered at uCoz with your help becomes your referral after he creates a website. If your referral creates a free website (doesn't pay for any additional features) and his website is approved as active by the system, then you get $0.5 If your referral pays for any paid service, you get 20% of his payments. 2. How to join the affiliate program? To work with the affiliate program you have to be a uCoz user. Please register at ucoz.com if you haven’t done it yet. To work with the affiliate program you have to use your Webtop, which is your online uCoz “desktop”. You can log in to the Webtop using the second password you’ve been asked to set while registering at uCoz. Go to guid.uid.me to log in. Now you’re in! Start posting the link and getting referrals. 3. Where do I get the ref-link and how does it look like? You can get the referral link via U → Websites → Affiliate program → General. 4. What can I earn from? You get $0.5 for each referral website created with uCoz which is approved to be alive in 3-6 months after actual creation (a website activity is determined by the system automatically on the basis of a long-term analysis of the website traffic). You get 20% of all the payments for the uCoz services made by your referrals as well. 5. How to attract users and deal with referral websites? 6. How to get the money I’ve earned? Log in to your Webtop and order the payout via U → Websites → Affiliate program → General. 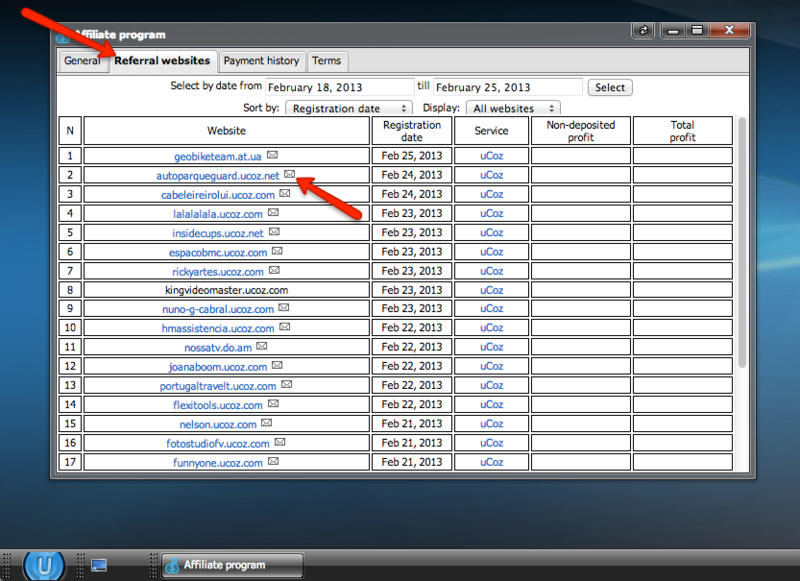 Transfer of funds to a website account is convenient if you pay for services or packages. If you have several websites in one Webtop, you can transfer the funds to any of them. There is no transfer fee. The tab "Payment history" contains the info on all ordered payouts, and their statuses. after the reward has been deposited, the partner can submit a request to get the funds via PayPal or Webmoney, or instantly add the funds to the account of one of his websites.